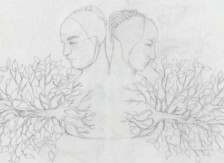 Flora – Alice Maher / Venio Ex Oriente – Nuala Ní Dhomhnaill | Poems | The Poetry Project – A celebration of Ireland’s literary and visual creativity. ná gealfaidh do láimhín bán. is gur dorcha a dath. would not make bright your small white hand. vials of the honey of wild bees. that has darkness in its tint.